Despite having a brand new baby only two months ago — baby girl number three in four years mind you — I decided I did not want to wimp out when it came time to plan my Savannah’s fourth birthday party. Though I will admit the thought crossed my mind. More than once. But ultimately, I figured that our lives had been disrupted enough this summer; we really haven’t left the house much since baby’s arrival. I figured I could at least give her that. And I am so glad I did. My baby girl loved her party, and the break from our self-imposed house arrest (maybe more). I mean come on guys, it’s been about 100 degrees every day since June. Savannah is currently obsessed with everything mermaids and every thing princesses. Which means that planning her party this year was kind of a no-brainer. Perfect, because this tired mama desperately needed easy. I will admit I was a little later to the party planning game than I like to be, this time around. Luckily we found an adorable mermaid themed invite on Etsy, which we printed ourselves at home, on card-stock from our local craft store. (This saved us time and money.) I also found coordinating garland (here and here), a super-cute mermaid cake topper, and a few other party items online. Have I told you lately that I love you, Etsy? Because you, my virtual friend, are a major lifesaver! 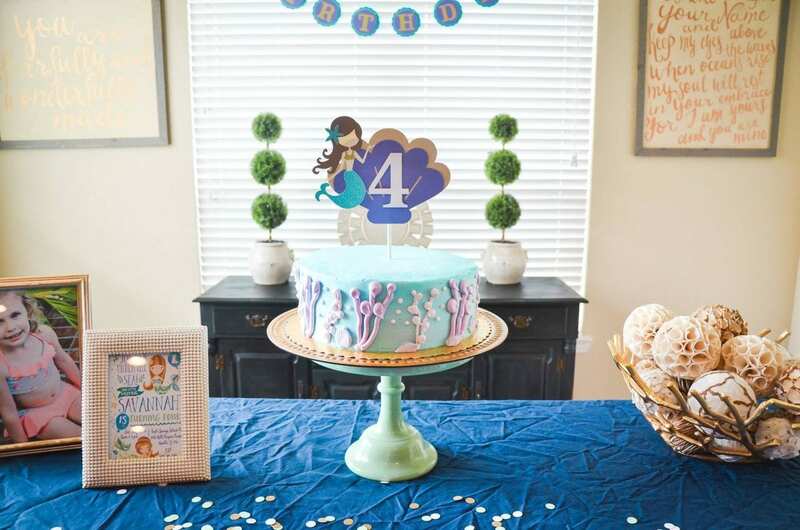 Thank you BlueOakCreations for the adorable party decor! It was such a fun addition to our cake table. Thank you BlueOakCreations for the fabulous seashell garlands! Our party would not have been the same without you. We held the party at our neighborhood Splash Pad — shaped like a giant pirate ship. I mean come on, could it have been a more perfect location for a mermaid birthday party? I think not. My girls are obsessed with the Splash Pad, and I knew Savannah’s little friends would be also. Plus, it was the perfect way to cool off on a hot, summer day — without being responsible for keeping an eye on everyone’s children in a swimming pool. We purchased the mermaid birthday cake from our favorite Texas grocery store (HEB) for a whopping $22. Can you believe that?! We brought them a picture, and this is what they came up with. I was so impressed. And the cake was delicious. We also had cupcakes iced to match the party colors: purple, mint, blue, and gold. I’d say it was a smashing success! And super simple to achieve (probably my favorite part). Thank you LittleBannerShop for the beautiful Mermaid cake topper! This was the perfect addition to Savannah’s party.